To jump to a section below, please click the link. Their name comes from the pale horseshoe shape on their chests, which is said to resemble the setting or rising sun. No two markings are the same. They have a very long tongue at 20 – 25cm. This helps them extract honey from bee hives, earning them the alternative name ‘honey bear’ or ‘beruang madu’ in Malay and Indonesian. Sun bears live in tropical lowland forests and are the only bear in SE Asia. They are mainly diurnal and do not hibernate but build nests in trees to sleep in. They are omnivores and primarily eat invertebrates, fruit and honey. 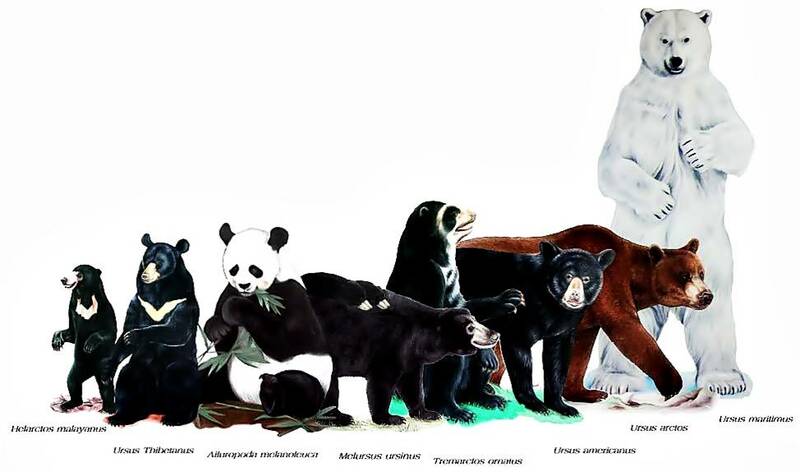 Sun bears are the smallest bear. 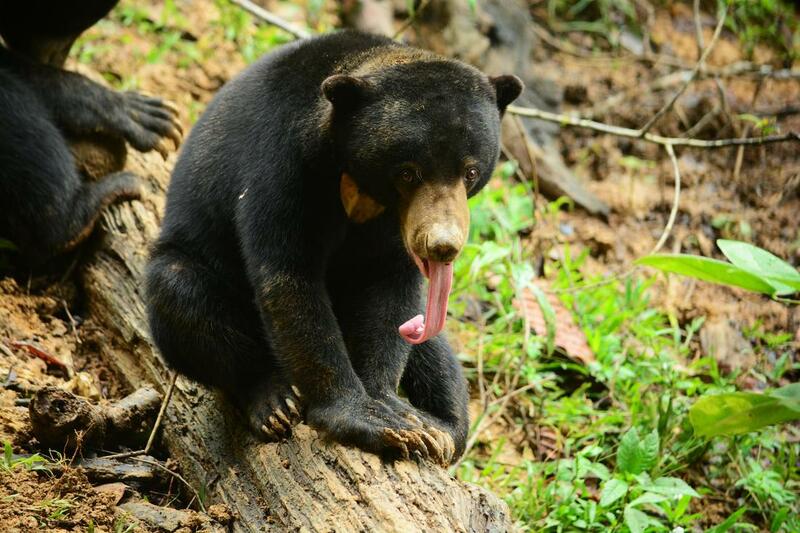 Sun bears have very long tongues. 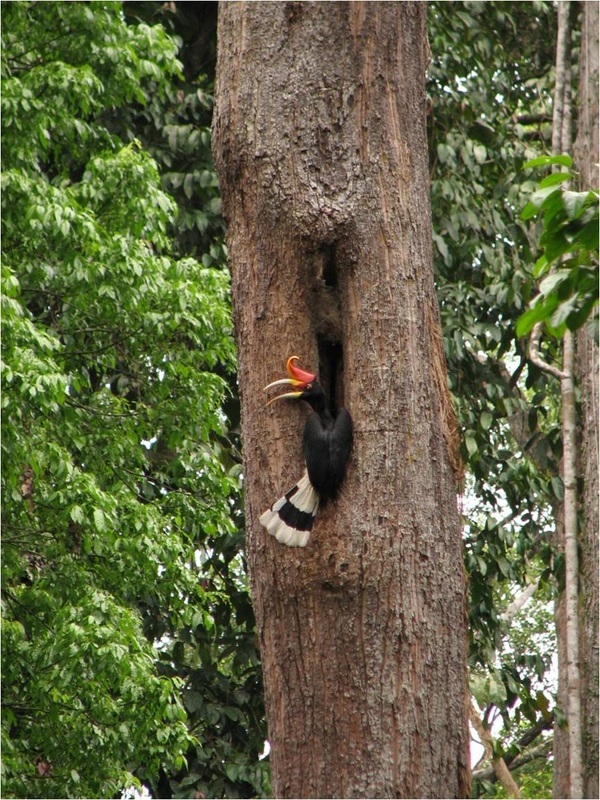 Hornbills nest in holes made by sun bears. Their natural behaviour helps ensure the health of the forest. They help disperse seeds and keep termite populations down, helping tropical tree species. They dig for invertebrates in the soil, which enhances the forest’s nutrient cycle through the mixing of rich and poor soil. And they create nesting sites for animals such as hornbills and flying squirrels, by tearing open tree trunks to reach the honey inside. Deforestation is a major threat to sun bears. 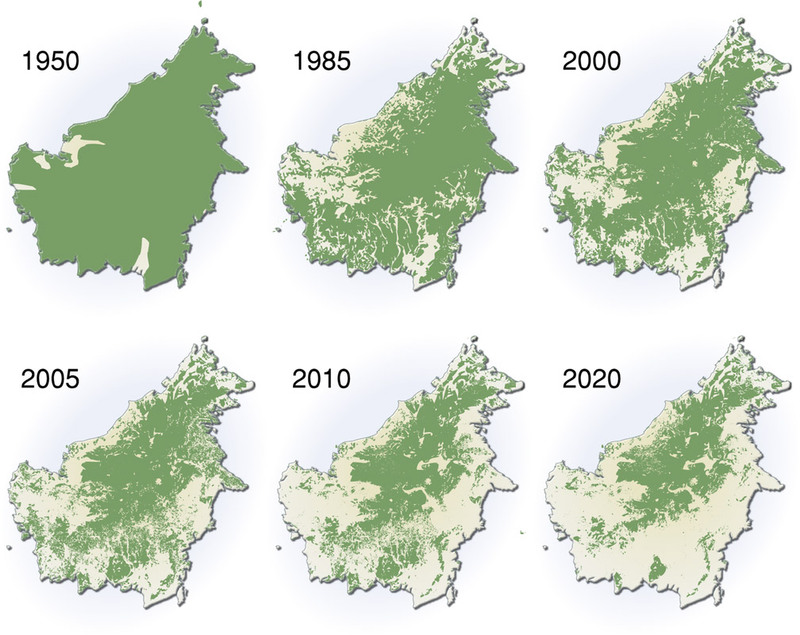 Habitat loss - Like many species, deforestation and degradation of habitat has dramatically decreased their numbers. 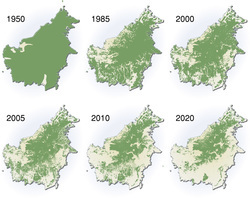 The main causes in Borneo are plantation development, unsustainable or illegal logging and human-caused fires. In Sumatra and Borneo, large-scale conversion of forest to oil palm or other cash crops is proceeding at a rate of 1,000s of km² per year (Holmes 2002). Commercial hunting - Sun bears are primarily hunted for their gall bladders (for use in Chinese folk medicine) and bear paws (as an expensive delicacy). In China and Vietnam, bile is milked from bears while they are still alive. Bears are routinely restocked as they do not live long. Killing sun bears is illegal in all of their native counties but is largely uncontrolled. Pet trade - Sun bears are the smallest bear in the world. As such, their cubs are considered incredibly cute and there is a high demand for them as pets. The mother is killed and the orphaned cub is removed from the wild and commonly kept in small cages with inadequate care. If you see or hear a captured sun bear contact us or your local authorities immediately.